Most people who love the sweet-and-sour tang of balsamic vinegar have never tasted the real thing and, with prices for a 3-oz. bottle ranging from $150 to $500 depending upon age, aren't likely to. As for ingredients, "aceto balsamico tradizionale" contains only one -- grapes. Not all the closely guarded family secrets involved in the transformation of the fruit of the vine into this precious elixir are known, but many years of aging inside barrels fashioned from different varieties of woods are minimum requirements by law. 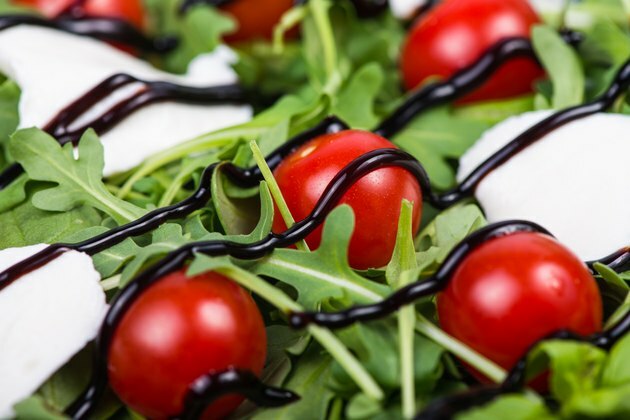 According to "Modena Balsamic Vinegar," true balsamic vinegar only comes from Modena and Reggio in the Emilia-Romagna region of Italy west of the city of Bologna, where it has been produced by aristocratic families for centuries, mostly for their own consumption. In medieval and renaissance times, drinking a little balsamic was believed to cure the plague. When the Este family ruled the region, Archduke Francesco IV of Modena used to present bottles to people he considered worthy of receiving them, such as heads of state. Two names indicate authenticity, "Aceto Balsamico Tradizionale di Modena" and "Aceto Balsamico Tradizionale di Reggio Emilia," protected trademarks under both Italian and European Union laws. At summer's end, white Trebbiano grapes and a few other varieties grown in the region are harvested and crushed to produce juice, called "mosto" or, in English, "must." After simmering in open pots over a direct flame for 24 to 30 hours, the must reduces in volume by about half. From there, the amber-colored liquid is transferred to the first of a sequence of barrels made from various woods which, depending on the preferences of the maker, may include ash, oak, chestnut, cherry, mulberry and juniper. All have bungholes covered with cotton cloth to permit maximum air exposure, oxidation and evaporation. A small amount of "mother," red wine vinegar, is added to start fermentation. By law, traditionally made balsamic must age for at least 12 years, although more expensive varieties may be aged 20 to 150 years. Annually, the vinegar is transferred to progressively smaller barrels and "topped off" with younger vinegar from the next larger barrel. Over time, more and more water evaporates as the liquid mellows, its flavor influenced by the different woods. Since the barrels retain substances from previous fermentations that add to flavor, they're never discarded: when they wear out, new barrels are constructed around them. On average, 800 gallons of grapes are needed to yield 30 gallons of vinegar. Commercial grades of balsamic vinegar are also manufactured in Modena but aren't subject to the same laws governing aging and production as "tradizionale" vinegars, so bottles don't carry trademarks. White balsamic vinegar is made from the same grape juice but is cooked differently, aged only for one year, and has a lighter flavor. "Bon Appetit" magazine recommends using it when you want balsamic flavor without the dark color. When shopping for mass-produced balsamic in supermarkets, "Gourmet Oil and Vinegar" suggests examining labels because inferior varieties often contain added caramel or brown sugar. How Many Calories Are in Malt Liquor?